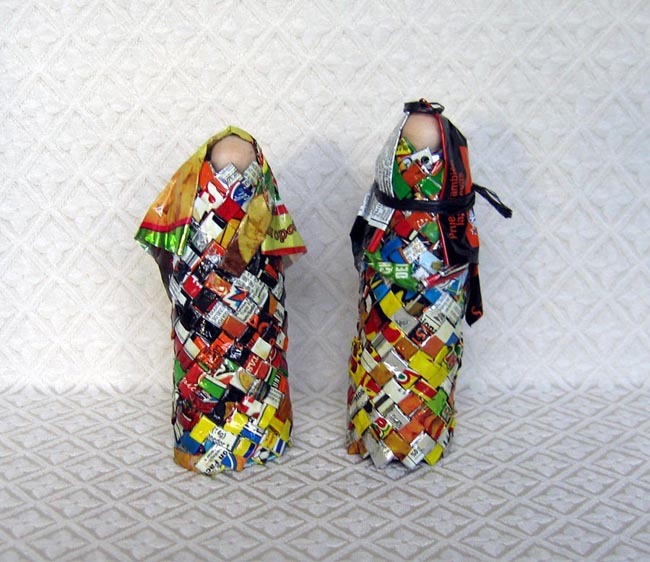 This Holy Family is made from intricately woven snack bags. The bags are cleaned and cut into strips the size of gum wrappers. Then the strips are folded so that the pieces can be woven into each other. Mary holds baby Jesus. Both Mary and Joseph have wood faces. Joseph stands 6 inches tall. The figures are made by a boy named Fredi in Trujillo, Honduras. This project is an effort to teach youth skills that they can use to earn income once school is done for them.